"We found Elvis on our doorstep in a dog crate with a note attached." It was almost a decade ago when the people at a special place for animals in North Carolina first met Elvis — but they'll never forget it. On April 26, 2009, the phone rang at Carolina Tiger Rescue (CTR). On the line was a woman's voice who said that a friend of hers had a pet she couldn't take care of anymore. The woman wished to remain anonymous. 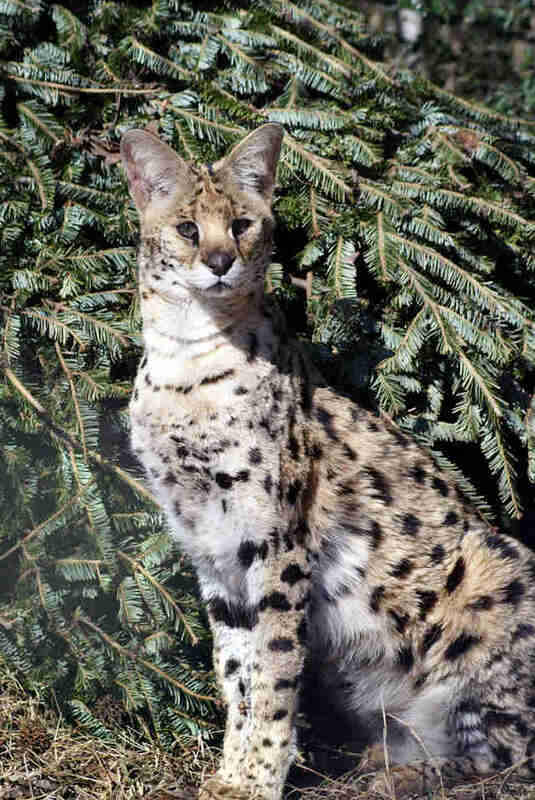 The pet was a serval cat, a kind of wild feline native to Africa. The next day, CTR staff found a dog crate on the sanctuary doorstep. 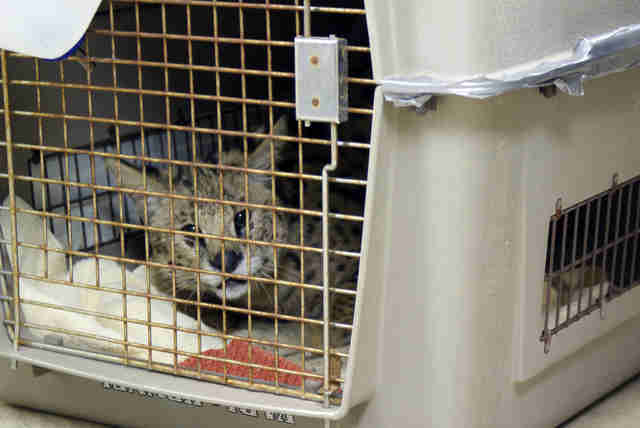 Elvis the serval was inside — and he wasn't in good shape. "We found Elvis on our doorstep in a dog crate with a note attached, telling us about his former home and his name ... His note was signed, 'Love me tender, Elvis,'" Jessika Morgan, communications coordinator for CTR, told The Dodo. 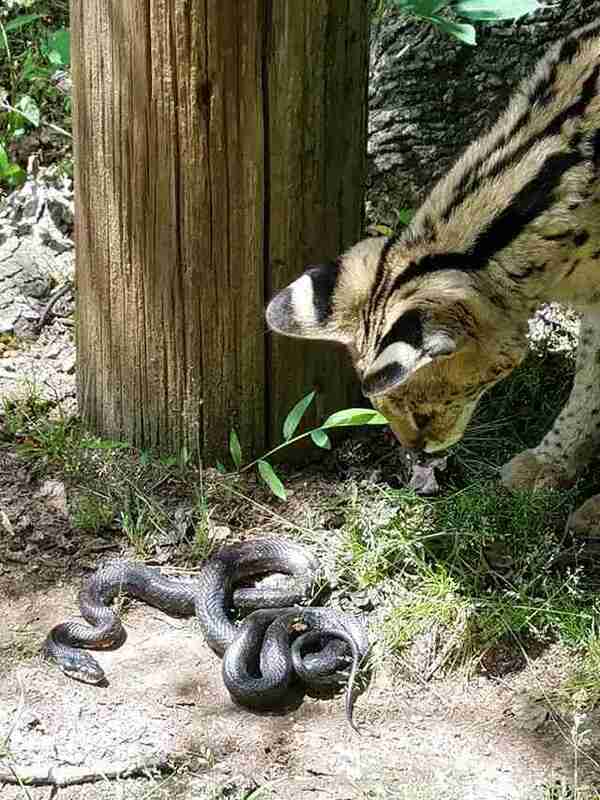 Even though CTR explained to the caller that the serval's owner would have to meet with a particular person at the sanctuary to arrange the rescue, especially since there were already two new resident tigers in quarantine and there was little room for the new serval, it seemed the owner couldn't wait to give Elvis up. 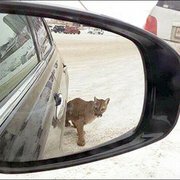 "He became too large and too aggressive for his owner to handle; it’s not his fault, he’s a wildcat with wildcat instincts," Morgan said. "We found a way to make it work; we couldn’t turn him away." When Elvis was given a spacious and lush natural enclosure, it took him some time to adjust. "He walked in circles for a while, indicating to us that he was confined to that crate for a while," Morgan said. "His collar was also ingrown, and we had to sedate him to cut it out. It probably hadn’t been changed since he was a kitten." As his rescuers watched him settle in, they noticed signs of a further problem. "Once Elvis settled in, our animal care team discovered one morning that he wasn’t putting weight on his back leg," Morgan said. 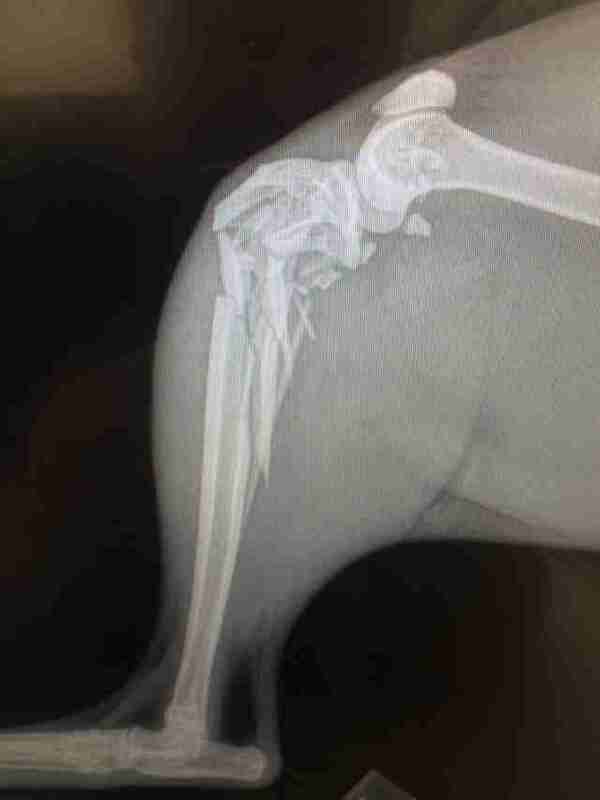 They gave Elvis's left hind leg an X-ray and were surprised by what it revealed. "It was shattered in more than a dozen places — and we still aren’t sure how it happened," Morgan said. The leg just couldn't be saved, having been left in such a state. So Elvis had to become a three-legged serval. Luckily, his resilient spirit saw him through this further change, and he seemed to adjust quite well to the loss of his leg. "Elvis lives happily on our tour path, still able to run and jump up onto his platforms!" Morgan said. And as social as Elvis is with people — he loves rushing over and greeting visitors who come through the sanctuary — it's still clear that he has that nature of a wildcat. 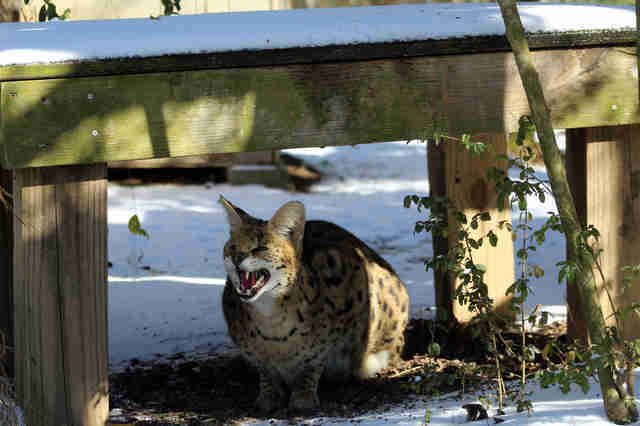 "Many of our servals were former pets," Morgan said. "Elvis’ story speaks to that and what we believe: These animals should not be pets." Elvis is now about 10 years old, and seems to be enjoying his life at the sanctuary. 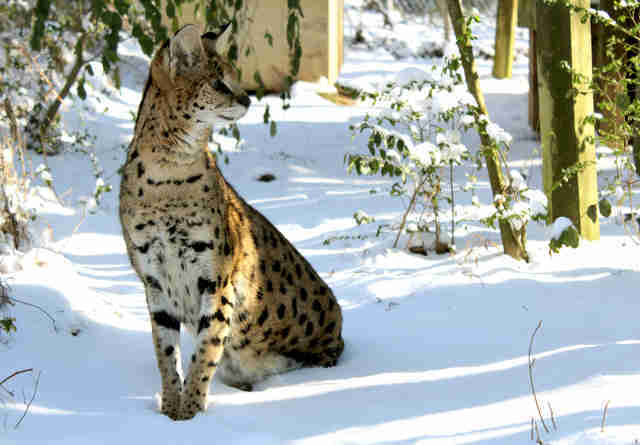 But many large cats like servals are being kept as pets across the U.S. because of a lack of legislation against it, and could be suffering from health and behavioral problems as a result of being kept as pets. 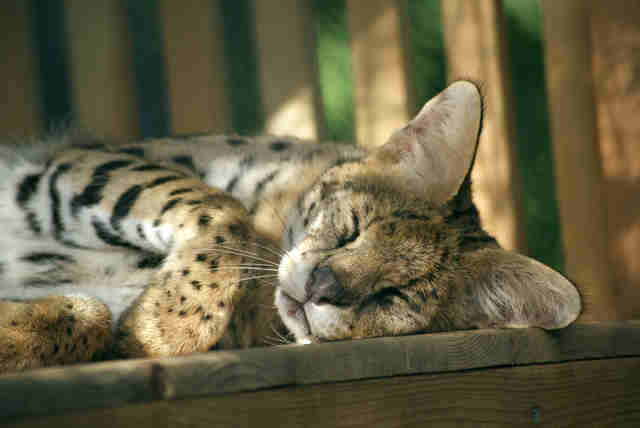 People often give up their serval cats once they become fully grown. Luckily, Elvis finally has the forever home he needed — with room enough to let his personality shine. 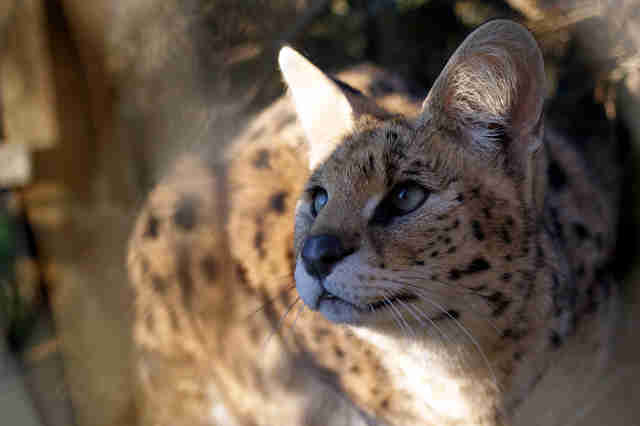 "He is indeed a very sweet serval," Morgan said. To help CTR care for Elvis and all its other animals, you can make a donation.